Several years ago I tore the meniscus in my left knee. I’m not an athlete but I know exactly when and how my torn meniscus happened because I was doing something stupid. I needed to put a box on top of a large stack of boxes piled on top of a desk. The pile was out of reach from the floor, so obviously I needed to be on the desk. Instead of taking a few seconds to get a step stool, I put my left foot on top of the desk, pushed off with my right, and used my left leg to lever myself the rest of the way up. Halfway up I heard and felt a pop in my left knee. Oddly, I also felt a strange rippling sensation on the right side of the knee joint. 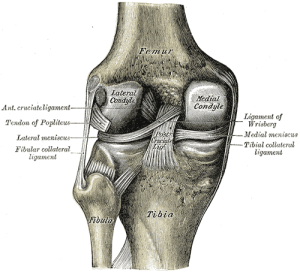 Referring to the illustration, the medial meniscus is on the right side and I presume that is the one that tore. There was no immediate pain and I had no trouble finishing the motion and putting the box on the stack. I was much more cautious climbing down. Within a few minutes I noticed my knee starting to get a bit stiff. Within half an hour it was visibly swollen. Walking became progressively more uncomfortable and difficult. Once I managed to get home I applied the standard RICE therapy: Rest, Ice, Compression, Elevation. This torn meniscus event certainly put a crimp into my mobility for the next several weeks. I virtually stopped all my daily exercises except for a light, upper body workout. Daily walks were out and just getting around the house became moderately challenging, especially stairs. But I stuck with the RICE treatment and then added heat after the swelling lessened. Movement became easier and I gradually felt improvements in the joint. The one action that I am convinced helped greatly was doubling up on my dose of the Dr David Williams joint formula. Several months after this injury I saw my physician and told him the story. He is the one who named the injury as a torn meniscus. Before that I only knew that I had injured my knee. After examining the joint, he said it was fully healed and that I had no restrictions on activity. My only regret is that I did not know about these amazing exercises for knee injuries. If I had known then what I know now, I am sure my knees would have been fully healed and even stronger than before the tear. Knee injuries are painful and slow to heal, unless you know the right ways to exercise. With effective information you can use proper exercise and strengthening techniques to fully recover from a knee injury. Click here for Knee Injury Solutions.